News at Spencer Public Library: March Activities for Grown Ups! March Activities for Grown Ups! Spencer Public Library’s Poetry Contest is in full swing. 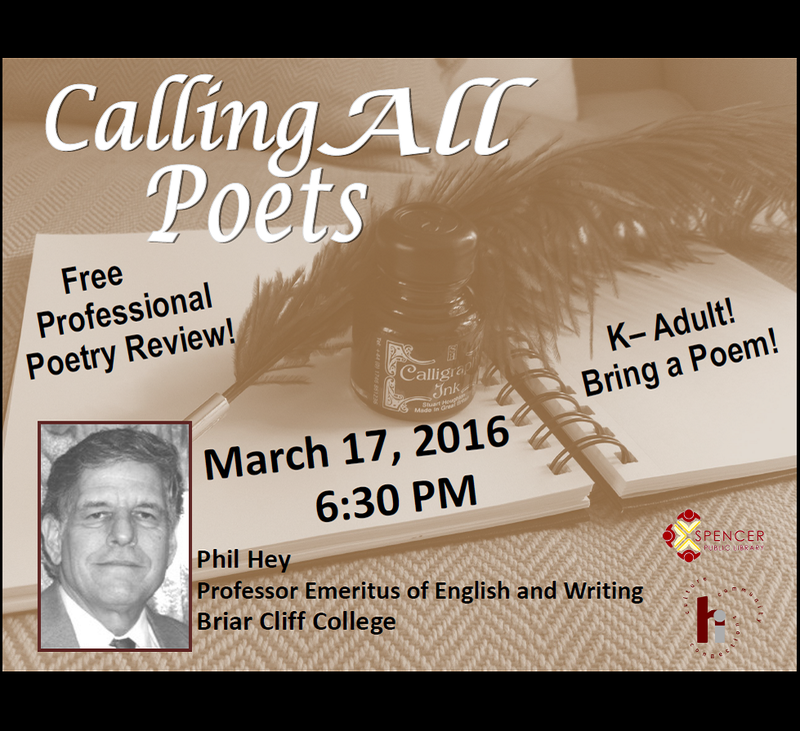 So, before you put the finishing touches on your most prized poem, head to the library to get a free professional poetry review. 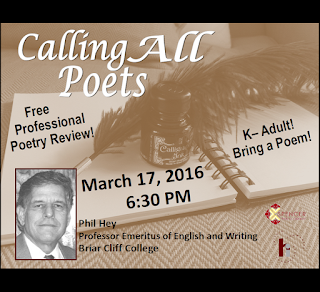 That’s right, Phil Hey, Professor Emeritus of English and Writing at Briar Cliff College will be hosting, “Calling All Poets”. We want you to bring your original poem to the library and let a professional give you some pointers. Be sure to take advantage of this unique opportunity and unleash your inner poet. Don’t forget to sign-up to read Sense and Sensibility by Jane Austin for our Books to Movies Club. Austin’s novel, originally published in 1811, is an intimate glance into the everyday lives of women in early nineteenth century England. The book is an extended debate between logic and emotion and how different people use those two different approaches in love and relationships. We will watch the movie, “Sense and Sensibilty”, starring Emma Thompson and Kate Winslet in April. Let’s hope that the bad weather we had in February does not follow us into March. Due to a weather cancellation, the library will have the DIY Beauty Products in March. The March Movie is “Bridge of Spies” directed by Steven Spielberg and starring Tom Hanks. “Bridge of Spies” is a dramatic thriller set against the backdrop of a series of historic events during the Cold War. A Brooklyn lawyer is thrust into a CIA mission to negotiate the release of a captured American U-2 pilot. Based on a true story and receiving excellent reviews, this movie is one to see.